Thank you. in this day and age of Youtube, nothing frustrates me more than hear about a "Live" feed of a panel, but when i log on it's a bunch of typed, transcripted conversations. WT? it doesn't have to be a Hollywood extravaganza. Just find an intern, journalism student, or a film student, or someone that likes camcorders, in the panel room. and upload the footage…simple. thank you again Jay Jay, for those of us that could not be there. Thanks for recording and sharing this, JayJay. I'm looking forward to sitting down and watching the whole thing soon. One of the most interesting things discussed in the panel was tailoring stories to fit the new media. Web shows are created differently from TV shows. Felicia Day recently said in an interview that The Guild and her new web series Dragon Age are made to show well on the web. IMHO they do. Ditto Dr. Horrible. Ebooks are being put out in all sorts of different lengths and prices, a perfect flexibility for that type of publishing and one that wouldn't have worked for paper books. Shows that are made for TV are structured in a particular way for TV and cable TV came along and mixed that up a bit for their format. The stories in video games play out in the way that is tailored for that medium. And, historically, making stories fit the medium has proved to be a path to success. But for a while now there has been a trend in comics that is kind of broken. "Decompressed" and fragmented storytelling might be wonderful in a graphic novel or trade paperback, but it doesn't seem to work well for single issues of comics. Many of the comics I have picked up recently seem like they don't work as single issues, or at all in some cases. But I guess publishers are bent on selling the same content multiple times to the same buyers, so it keeps on. Comics will never go away entirely. They are too easy for an individual to produce on their own and that will always have value to creative types, but mainstream comics sales continue to decline and it's not hard to see why. Thanks for your answers, especially since I didn't expect them! "I say gimme that and let me try!" The great thing about this new age is the low cost of tools. So much freeware. Yes, it is true that one gets what one pays for. I'm frustrated by free GIMP (terrible name!) and plan to upgrade back to Photoshop. Nonetheless, one can do so much more free today than back in the analog age. OpenOffice beats a typewriter. "There is plenty to say." There will be even more to say the more wired we get. The Internet has exposed me to people I'd never otherwise talk to. Introduced me to alien thoughts. Made me react in unexpected ways. The dialogue doesn't just continue; it expands. "all kinds of interactive, collaborative things will grow." Wikipedia is a huge collaborative encyclopedia. Its English edition now has almost 3.8 million articles on subjects that would never make it into an old school print encyclopedia: e.g., the extinct scripts that I work on. That number can only go up. The Marvel and DC Universes are huge collaborative mythologies. And they're not entirely the product of professionals. You've written about how fan contributions were integrated into the Legion almost fifty years ago. Put the two together and you get … Wikiverses. I'm not a lawyer, but I imagine there would be rights issues. What if a Wikiverse took off? Who would profit from the merchandising? I don't have the answers, but I'll bet something will be worked out. I'm not happy with the way American comics are going, but I do look forward to the future of entertainment as a whole. Even if DC and Marvel vanished, that wouldn't stop creators from telling stories with words and pictures. One interesting thought extrapolated from the guys in the middle. Did Apple become the Big Brother they rallied against in 1984? Are the creators churning out stuff, like the IBM knobs in that first big commercial, lost in an emotionless abyss? Good to see Jim out there, swinging the hammer for heroes, and good storytelling. Futile? Don't think so. Not easy? True that. 3. The new media give us more tools, an expanded palette. I say gimme that and let me try! Clueless creators with better tools are still clueless. They'll just have new ways to make a mess. People who have something to say and the skills and abilities to express it will thrive. New tools mean new challenges as well as new opportunities. We're going to have to be better, work harder. We've been confined, metaphorically, to black and white. Now we have to think in Technicolor. There is plenty to say. I have plenty to say, more every day, and I've been at this for 47 years. 4. Tell a good story and tell it well. 5. Truth will out. I hope. 6. IMHO: The spectrum is widening. Linear stories will still be around, but all kinds of interactive, collaborative things will grow. Technology may yet help our labor-intensive creative process along. We'll see. Very cool. Watching part 4 while typing this. Interesting panel discussion, and I echo the thanks to Jay Jay and Freddy for sharing the experience. Subscribed. May have to watch a few times, to better digest. Liked the audience response to Jim's blog. Jim, loved the "Big Bang Theory"-ish guys in the middle (joke). Right, getting to know them better by your excellent introduction of your co-horts in the previous "blog" post. Will understand them better later. Hmmm! It's nothing like I expected. I'm guessing you sat next to Cory. To be honest, I've never heard of him, but I'm 100% behind everything he said. I loved the fact that he bought up the problems with the DMCA. I like the way he broke down the numbers on what motivates advertisers. The nuts and bolts of what works and doesn't work is usually all I care about. I even liked the way he brought up that technology alone does not replace the role of a storyteller or someone who weaves the suspense. I really thought this would go more into future of technology itself rather than 5 year game plan of what's already inevitable or in the works for the entertainment industry. Regardless, it was an interesting discussion. In many ways, I feel technology has already moved past what the discussion was about. Science has computer chips that interface with brain tissue. Scientist are able to extract muddy video images of what people see by monitoring brain activity. I'm not complaining per se, but this is more along the lines of stuff I was pondering 10 years ago. 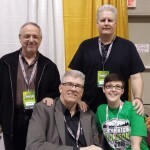 I apologize for leaving out the most important point: a big thank you to you and Freddy for uploading and filming this video so that those of us who couldn't attend NYCC could briefly partake of the wisdom of a real-life Fantastic Four. I'm glad the video was cut into six parts because it took me over 2½ hours to process it all. I needed breaks between each part. So much to think about. A few points: one personal, others more general. Numbers refer to video segments. 1. I have no plans to ever watch broadcast or cable TV again, not counting accidental viewing. I am more interested in what you, Jim, and others are writing on the Internet in real time than anything Hollywood produces. We're all content producers now. 2. Now I know what it's like to live the webcomics creator dream. But what do the rest of us not featured on Boing Boing do? 3. Cory Doctorow: "We have to figure out what the story is." Technology changes, but that never changes. Jim: "You need better writers." Better technology isn't enough. I saw my first and only IMAX movie seven years ago. The medium isn't as important as the message. What can creators say that no one else has said before? How can they use new media to express what couldn't be expressed before? 4. It's hard enough to get used to new media. Holding onto an audience may be harder than ever. Be careful. Clarity still reigns. Listen to Vonnegut. 5. The American comic book industry is lacking in creativity, but creative people are still out there. The problem is … how does the audience find them and their work? What's the next step in search beyond Google? 6. Will interactive fiction become bigger in the future? Will we personalize stories to go the way we want them to? Or will we collaborate with others to build universes? Drawing comics is extremely labor-intensive. Can artists keep up if comics become an interactive medium?